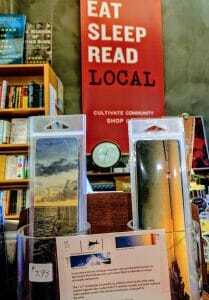 Cariappa’s heirloom quality, canvas bookmarks are available exclusively at the independent, New Orleans bookstore, Octavia Books. The 7 x 2” bookmarks are printed by Cariappa on thick, archival matte canvas using archival pigment inks, coated with UV resistant varnish, and hand-trimmed with rounded corners. Cariappa’s initial and seal appear on the reverse. 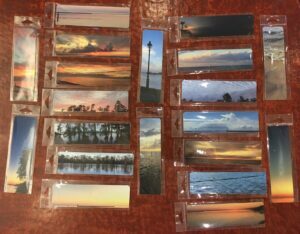 The bookmarks are in individual, sealed, cellophane covers. Cariappa designed and produced the product. Snapshots of the recently refreshed inventory, conveniently positioned at the checkout counter.